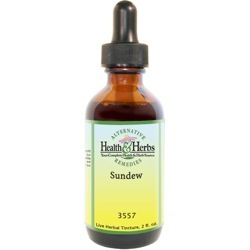 Sundew Leaf is an antispasmodic, expectorant, and sedative and has been used for a dry, irritable, persistent cough. It is believed to be quite effective in treating other respiratory infections. Due to relaxation, it provides for chest muscles, it can relieve asthmatic coughs, with nervous irritability. It is used as a remedy for all chronic coughs of a dry, chronic bronchitis, irritating character, especially if the central nervous system is irritated. It has also It has been known to relieve coughs of sympathetic origin and so-called nervous coughs. It will cure the cough of measles more quickly than other remedies, and it has been used for centuries to terminate a whooping-cough, which leaves the patient free from a cough, when the active stage of the disease has passed. It has also relieved asthmatic coughs, with nervous irritability. It has been used as a sedative and tonic in irritable conditions of the stomach, relieving flatulence and curing mild cases of gastric ulcer. Externally, it has been used to treat warts, corns, and bunions. Ingredients: Sundew, Structured Water, 20% Alcohol. Non-Alcohol: Sundew, Structured Water, Vegetable Glycerin. Instructions: Use 6-12 drops in juice or water, under the tongue. May be taken 3 times daily. Shake well. Store in cool dark place. Keep out of reach of children. Contraindications: Higher levels may lead to gastrointestinal irritation in some people. Pregnant women and breastfeeding women should avoid use of sundew. At the time of writing, there were no well-known drug interactions with sundew. From Brian Crouse, ND, LAc of Hauppauge, New York on 5/9/2015 .